"Delicious doesn't have to be hard with this simple salad from Gaby Dalkin of What's Gaby Cooking." Preheat the oven to 400 degrees F. Slice off the beet leaves close to the tip of the beet. Discard the beet greens. Scrub the beets thoroughly, and then loosely wrap each one in foil. Transfer the wrapped beets to baking sheet lined with Reynolds Wrap(R) Aluminum Foil. Roast for 50-60 minutes. Check the beets every 20 minutes or so. If they are starting to look dry or are scorching on the bottoms, dribble a tablespoon of water over the beets before rewrapping. Beets are done when a fork or skewer slides easily to the middle of the beet. Cool the beets until they can comfortably be handled. Hold one of the beets in a paper towel and use the edges to rub the skin away. The skin should peel away easily; if it doesn't, the beets likely need to cook for a little longer. Slice the peeled beets into wedges. 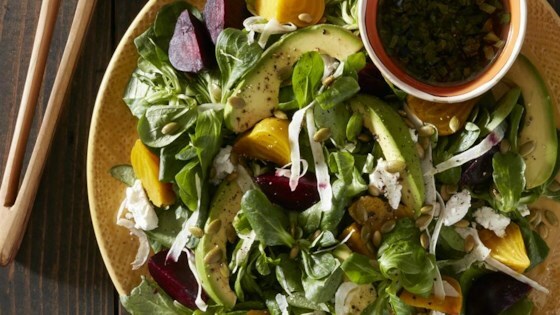 Combine the beet wedges, mache, goat cheese, avocado, and shaved fennel on a large serving platter and drizzle with basil vinaigrette. Sprinkle the pepitas on top and serve immediately. I loved it, my wife and 11 year old grandson...not so much! It's not hard but it is a lot of work. The red beets will stain your hands for a bit. This recipe was quite good - next time I'll use a different vinegrette and perhaps adding some pickled chanterelles, but all in all very tasty. This was absolutely a winner! I couldn't find mache so used watercress instead. plus I used walnuts. Golden beets, and raspberry vinaigrette. The basic recipe is just SO good!